A beautiful twisty and twiggy larger size Chinese Elm [Ulmus parvifolia] bonsai favourite. Potted into a classic blue ceramic bonsai pot. 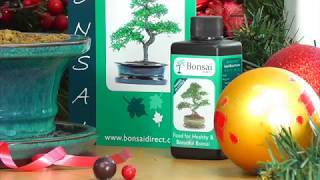 This bonsai is 12 years old and is supplied with full care instructions and a Merry Christmas Red Star. A beautiful bonsai which also signifies love, balance, calm and a peaceful energy. Delivery is FREE to most of the UK and weekend delivery is also available. A bonsai favourite, a nice sized bonsai with lovely s-shaped trunk and Merry Christmas red star. The Chinese Elm is a lovely twiggy bonsai and makes a wonderful representation of a woodland tree. This beautiful Chinese Elm, potted in a Chinese glazed bonsai pot has a lovely flowing trunk and is a great size for a windowsill or desk. Easy to care. Highly Recommend and ideal for a beginner.